ESG has been described as “the new bottom line” by Goldman Sachs. It's hard to argue with that when there's $59 trillion committed to ESG integration via the PRI, and it's on the agenda at the G20 and the Bank of England. 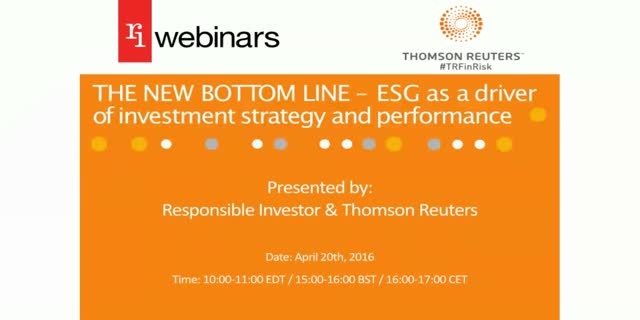 This RI Webinar with Thomson Reuters examines how incorporating ESG issues into investment analysis and decision-making processes can mitigate portfolio risk and enhance performance. *“The New Bottom Line” is attributed to Goldman Sachs. An ESG Webinar focussing on green bonds from an institutional investor perspective | From pioneering Clean Energy Bond programs to flexing their stewardship muscle on key social issues during the proxy season, state and municipal treasurers are waking up to their influence in the capital markets. This unique webinar will explore the market power of public sector pension funds in accelerating the energy transition, enhancing corporate governance standards at the world’s largest corporations, and in addressing key social issues holding back economic growth - inequality and systematic under-investment in human capital development, public healthcare, education and transport infrastructure. Join us to learn how state and municipal treasurers are responding to key ESG themes. Find out who is leading the way, and what lessons have been learned en route to more robust ESG integration and long-term value creation. The OECD defines blended finance as “the strategic use of development finance for the mobilization of additional finance towards the SDGs in developing countries.” This RI webinar will move beyond definitions, to drill down into key areas of the blended finance debate. If achieving the SDGs requires a massive infrastructure build-out to provide clean water and sanitation (SDG6), affordable and clean energy (SDG7), and health centres and hospitals in urban and rural areas (SDG3), is blended finance up to the task? Expert speakers will present case studies on the integration of blended finance structures into existing investment strategies and explain how blended finance can yield a positive return both for investors and communities. Join Responsible Investor and FTSE Russell for an interactive webinar on green real estate! Climate change poses clear and material risks to real estate assets with the potential to impact return profiles. Real estate investing has historically lacked the appropriate tools to allow investors to assess their exposure to climate risk and to integrate it effectively in their investment strategies. * Data as of December 31, 2017 as reported on April 2, 2018 by eVestment for institutional assets, Morningstar for retail mutual funds, insurance products, and ETFs, and additional passive assets directly collected by FTSE Russell. Three years ago, the United Nations adopted the Sustainable Development Goals (SDGs) as a global call to action for positive change. Ever since, the global investment community has become increasingly eager to achieve some kind of “SDG alignment”. Near the anniversary of the establishment of the SDGs, this RI/ISS-ESG webinar provides an overview of how impact investing connects to the SDGs, and how investors are measuring effectiveness. - What drives investors to choose the SDGs as a framework for investing and how are they approaching this? - What tools are available to identify and measure companies’ contributing to the SDGs? Should SDG investments be focusing on products & services or on companies’ operations? - What are the challenges to investing in the SDGs? Are the SDG even investable in mainstream investment, given the fact that many of the SDGs and targeting problems in emerging markets that are probably rather solved by modest projects rather than large listed corporates? - Is there a risk of SDG-washing and sticking SDG labels on existing mainstream investments? How can this be prevented? How can investors think about sustainability in their wider corporate bond portfolios, and how are regulators and other public bodies beginning to address climate risk in bond markets? In this webinar, our experts discuss the current efforts being made to integrate ESG into the asset class and some of the lessons learnt so far. Lending books are arguably where the rubber hits the road for originating sustainable projects, but how do banks and other lenders identify ESG risks in loan books, and stimulate opportunities to lend to sustainable projects? In this sessions, our experts will discuss a number of initiatives that have been started to address mortgage lending, price adjustments and assessing risk exposure. A growing number of investors are screening out companies from lending portfolios because of exposure to climate change and other sustainability risks, but sovereign portfolios are often not assessed in the same way. This webinar looks at why: how serious are the sovereign default risks arising from ESG, how can they be quantified, and do investors have a responsibility to engage with governments on policy through bond buying? One of the most significant recommendations being pursued in the EU’s Action Plan is ‘to introduce a common sustainable finance taxonomy to ensure market consistency and clarity’. - In what way would it work? - How can such a taxonomy be both flexible and have integrity for identifying activities, assets and revenue segments that deliver on key sustainability goals? - How could the EU and its Member States apply relevant rules, and who would regulate them? - What would that mean outside of the EU? This webinar will answer these issues and many more, and let you pose your own questions on the Taxonomy. A successful ESG stewardship strategy requires investors to proactively address ESG risks in their portfolios. Over the last three years, climate change has become a top ESG shareholder proposal issue. Many shareholder proponents encourage companies to align their reporting with the recommendations of the Task Force on Climate-related Financial Disclosures, set GHG emission reduction targets, conduct 2°C scenario analyses and disclose on climate impact. However, the percentage of companies providing such disclosures remains generally very low. This webinar gives an overview of emerging climate change topics from the 2018 proxy season and how investors can proactively identify climate-related risks and opportunities in their portfolios. - What are the takeaways from the 2018 proxy season and Climate Week NYC 2018? - Are we any closer to meaningful scenario analysis? - How is data developing to help investors capture physical climate risk? - Where are we at with TCFD reporting? - How important is collaboration on these issues, through things like ClimateAction100+? Hear from the UN body that is evolving the SDGs 3 years on, on the Ethical Finance 2018 conference pre-event webinar. Ahead of the Ethical Finance 2018 conference on October 22/23 in Edinburgh, meet the United Nations Development Programme (UNDP), the lead UN development agency for implementing the UN Sustainable Development Goals (SDGs) with governments. The UNDP is a supporting partner for the Ethical Finance 2018 Conference, along with the UK and Scottish governments. On this webinar, Responsible Investor's Managing Editor will talk to Gail Hurley, UNDP Policy Specialist for Development Finance, about the work the UNDP is doing on driving the SDGs with policy makers, and about how they see the role of investors within that. Don’t miss out on the opportunity to put your questions to UNDP about the evolution of the world’s biggest sustainability initiative! Corporate: How is the production of ESG data evolving at the corporate level: what’s required, what’s optional, what’s the quality like and how is it changing? Thomson Reuters: What data are clients seeking? How ESG data is filtered, aggregated and scored, and based on what standards and definitions. How can data gaps be overcome? Examples of current interesting investment-relevant data. Asset Owner and Asset Manager: How are portfolio managers translating ESG research data into investment decisions: what’s working and what needs improving? One year after the launch of the final report of the Task Force on Climate-related Financial Disclosures (TCFD), hundreds of organisations are working on disclosing climate-related financial information, and a myriad of resources are being developed to support them in the process. • Understand how your experience can be shared on the platform to help others improve their reporting practices. · How are recent weather-related events, which are being linked to climate change, changing insurance pricing, coverage and market sentiment? Are ‘extreme’ events no longer so extreme? · What are the major ESG factors now that are influencing underwriting and capital provision at insurers? · Tightening regulation on ESG issues and its impact on the insurance industry. · Is the historical data available to utilise ESG factors as a performance predictor or gauge of risk quality? · The development of new ESG risk-specific insurance products. Differences in the above trends globally. · Why are insurers getting on the front foot around divestment in areas such as coal or tobacco? · Insurers as investors: how this asset owner sector is shaping its long-term allocations with ESG factors in mind. · What are the investment tools insurers are using to do so? Responsible Investor is proud to present a series of three webinars focused on European sustainable investment policy in the context of the High-Level Expert Group on Sustainable Finance (HLEG) and the stated objectives of EU Vice-President Valdis Dombrovskis. This is a crucial time for EU policy on ESG. But how will it affect you… and your clients? With Europe looking at investment mandates, sustainability definitions and green financing incentives, ‘the HLEG-effect’ will be far-reaching. The series will feature senior figures from the EU, leading market participants and expert analysts. There is also a plan to create a common language and classification system for sustainable investments. This ‘taxonomy’ will impact the investment landscape and could foster the construction of green portfolios: but what will it look like and who will oversee it? The most controversial idea that has been floated is for banks to get lower capital charges if they invest in green projects and companies. This throws up a lot of questions, not least the role of securitisation and the broader implications for responsible investment. Mandates are the anchors of the investment chain and the European Commission is proposing to integrate sustainability into the duties of asset managers. This presents a pivotal moment for ESG and we will drill down into all the implications. What would a pan-European set of investor duties mean in practice – and is it even possible? Join this one hour webinar discussing the complexities of PRI signatory reporting and emerging trends investors should consider in fulfilling client mandates and meeting their active ownership responsibilities. This webinar will discuss ESG integration into passive investing and smart beta strategies. The world of index-based investing is in flux as ESG integration into passive is on course to become the norm for new mandates as we enter the era of “Smart Sustainability”. Flexecutives anonymous. For Flexecutives with Sally Bridgeland and the Executive Shift panel. If you’re a flexecutive, join Sally Bridgeland in an ”agony aunt” session to discuss your personal dilemmas and challenges. We’ll help you “come out” as a flexecutive and become a role model for others around you. Sally founded Executive Shift at about the time she was named by Timewise as one of their 2013 Power Part Timers. She was the first group leader at BP to work part-time when she joined them in 2008, working a three-day equivalent week as the Chief Executive Officer of their UK pension fund. She now has a portfolio of directorships and trusteeships and a teenage son. She lives in Dulwich and works in a variety of offices, trains and cafes. Dispelling the myths about flexible working. For Flexangels with Jenny Ockwell and the Executive Shift panel. Jenny Ockwell, Executive Shift Trustee, diversity and flexible working enthusiast will draw on her experience working in asset management organisations to do some myth-busting about working flexibly. Do join us to add some of your own and discuss the practical steps that you can take to lay them to rest. Jenny has worked full-time, but flexibly, in a number of asset management companies over her 20 year career in the city. She is a member of the Diversity Project’s (www.diversityproject.com) Advisory Board and ‘owner’ of the DP Flexible Working steering committee. She lives in a small town in the smallest county in the UK and is married with 2 wonderful (but exhausting!) autistic boys.